Doughton’s time at Wladislaw’s was brief and probably unhappy. He appeared in court a number of times, once because of what may or may not have been the theft of one of his “trophies”, a Cossack gun he had brought back from the Crimea which he lent to the exhibition, and another time when he was locked in dispute with his employers – who fired him in early December 1856 after only three months. It’s a revealing story. A “Mechanical Panorama” was clearly a complex combination of “lifelike illustration”, a “moving background”, “mechanical figures, set in action by machinery”, music and sound effects (including violent explosions), and of course a lecture guiding spectators throughout. The result could be “indescribably affecting”. The show evidently successfully induced a range of emotion and expression – for example, the evocation of a “terrific” or “fearful” storm in the Black Sea was so effective that it “caused many to feel on their return to their own fire-sides a degree of comfort scarcely ever before experienced”, and prompted “many a sympathetic sigh … for the brave fellows whose actions and were being delineated”. … is now open in the Temperance-hall, Town head-street, and we can confidently recommend it to the public. Several panoramas of the war have recently visited Sheffield, but the one under notice is certainly superior to them all. The moving background of the picture is a fair geographical description of the Crimea, and the fore-ground is so arranged as to bring before the audience all the details of the operations of the army and navy. This is effected by exceedingly ingenious mechanical contrivances. The arrival of the fleet is fairly represented – ships and steamers move about the ocean with all the appearance of reality, and the troops are landed in boats before the eyes of the spectators. The march to the Alma and that memorable engagement is also witnessed, and following this are all the important events up the close of the war. As a work of mechanical ingenuity alone it is unique, and are glad its proprietors are likely to meet with liberal encouragement. The beautiful decorative painting of the Assembly room of our Town-hall, executed only a few years ago by Mr. Ward and his family, has, we regret to find, been much injured by the explosions, &c., of Wladislaw’s Crimean Exhibition, which visited Devizes few weeks ago, that it is considered absolutely necessary to re-paint a considerable portion of it. The expense of doing this – if it be anything like a work of restoration – will, we are told, cost the borough £35. The sum paid by the proprietor of the Exhibition for a fortnight’s use of the room was £6! 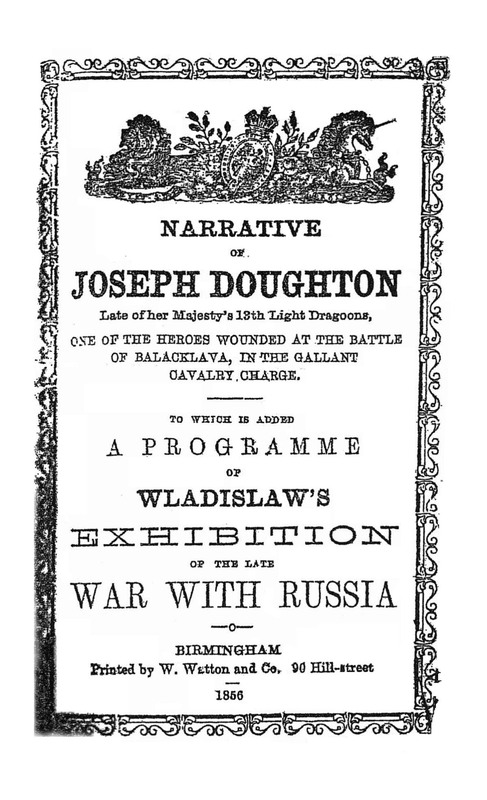 Joseph Doughton’s role was noted positively in several newspapers, as here: “The interest is greatly enlivened by the descriptive lectures given by Mr. Doughton, who was present at the celebrated light Cavalry charge at Balaclava” (Derby Advertiser, September 27th, 1856). However, things must have gone seriously awry because he was fired in early December 1856 after only three months (i.e. he had joined Wladislaw’s in August or September 1856). Curiously (and perhaps not coincidentally), during the same week as he was discharged Doughton appeared in court in Nottingham. One of the Russian pistols he had brought back went missing from the Mechanics Hall where they were on show and four young men were accused of stealing them. Doughton is said to have exhibited some of his own mementoes of the Crimea. In Nottingham in December 1856 one of the Cossack pistols he had brought back from the Crimea may have been stolen from the Mechanics’ Hall where the show (presumably Wladislaw’s) was being held, but it was recovered. Four young men were accused but managed to convince the court that they had acquired the gun in a pawn shop, having bought the pledge ticket cheaply from a boy. It is impossible to know from this what exactly happened and what involvement Doughton himself had in the affair. 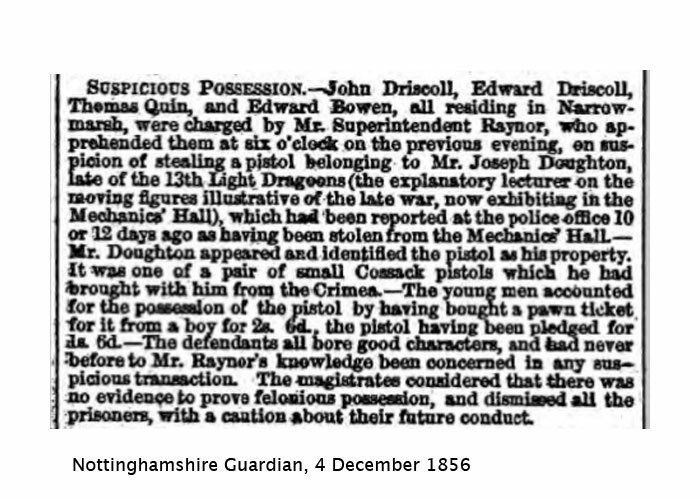 The possible theft of one of Joseph Doughton’s Cossack pistols, reported in the Nottinghamshire Guardian, 4 December 1856. In January 1857 the parties faced each other in court in Nottingham: Wladislaw’s claimed Doughton owed them money for their share of the sales of his booklet (nearly 2000, which they had financed), while Doughton, in a counter claim, claimed Wladislaw’s owed him £5 in lieu of a month’s notice when they sacked him. In the absence of witnesses, the court found against Doughton on both counts. Messrs. Wladislaw and Burgess v. Joseph Doughton late private in the 42nd Regiment of Foot. Claim £5 16s. 4d. The plaintiffs in this action were the joint proprietors of the Crimean War Exhibition of moving figures lately exhibited in the Mechanics’ Hall The defendant was a private soldier who had been engaged in the late war whom the plaintiffs had employed to officiate as descriptive lecturer of their exhibition. The plaintiffs sought to receive £5 16s. 4d. as due to them by the defendant, being the half proceeds of 2,000 copies of a narrative of his own life which they allowed him to dispose of at his lecture under an arrangement that they were to halve the profits. The plaintiffs were assisted by a solicitor, the defendant conducted his own case. The plaintiffs said that the lecturer had accounted for one weeks’ proceeds of the books, but afterwards declined to do so until his engagement were finished. He, however, had rendered an account up to a certain date of the sale, from which it appeared by a document in his own handwriting that he owed the plaintiffs £4 9s. 4d. Subsequently they had paid for an additional 1000 copies amounting to £1 10s., which amounts, allowing 3s. for waste, made their claim of £5 16s. 4d. The defendant denied the debt altogether. He said that his arrangement with them was that he should pay for the printing of his narrative and allow the person who assisted the lecturer as pianist 5s. per week out of the proceeds provided he sold 1,000 copies per month. He had been 14 weeks, upwards of three months, with the exhibition and had sold 2,000 copies minus 114, consequently he was not bound to fulfil his agreement as to giving the 5s. per week to the pianist. The defendant had no witnesses and an order was made for the amount. There was also a cross action by Mr Doughton against Messrs Wladislaw and Burgess for £5 claimed by him as a week’s salary and money in lieu of one month’s notice which they had not given him when they dispensed with his services. It appeared according to Mr Doughton’s statements that Messrs Wladislaw had agreed to give him one month’s notice before discharging him, also when engaging him he had stipulated for leave of absence for several days at 2nd December to receive his pension at Birmingham, and that when he came back the proprietors discharged him without notice because he had remained away from Sunday till Friday afternoon. The defendants denied that they had agreed to allow him several days absence at 2nd December, and said that he had only stipulated for one day, consequently on his return after five days’ absence they discharged him in consequence of the great inconvenience and loss to which they had been put and of their having had to engage another lecturer. In January 1857, the same month he appeared in court in Nottingham, Doughton was hired by yet another Panorama – Lancaster’s (obviously rivals to his previous employers) – where he appeared alongside an “Infant Drummer … only six years old … admitted by all who have heard him to be the greatest musical curiosity in the world” (Nottinghamshire Guardian, 15 January 1857). We are glad to learn that Messrs. Lancaster have availed themselves of the services of Mr Joseph Doughton, late of the 42nd Regiment of Foot, as lecturer to their excellent panorama. Mr Doughton, it will be remembered, was until recently lecturer to Wladislaw’s mechanical exhibition, and his description will doubtless add great interest to Messrs. Lancester’s entertainment. But Doughton can’t have travelled with Lancaster’s Panorama for very long because it seems he had returned to Hamilton’s by July 1857, when he appeared in Burnley. (Doughton is not named but given the reference to his serious injury at Balaclava it is likely to be him.) The reference at the end of a Hamilton’s advert to “free admission to the children and inmates of the workhouse” suggests custom had fallen away, and this particular panorama was nearing the end of its run. Joseph Doughton must at this point have stopped travelling with the Panoramas, and he married in 1858. In the 1861 Census he is described as a “Chelsea Pensioner and Victualler” living in Sawston, near Cambridge. He had three children between 1859 and 1864 but died in 1865 of “Bright’s Disease of the Kidneys”. (A fourth child was registered with his surname in 1867, but by this time Doughton had already been dead for two years.) He was just 33. I have written in more detail on the Lives of the Light Brigade website about Joseph Doughton’s life, and Doughton’s time with Moving Panoramas. There are a number of very helpful general accounts of Panoramas on Wikipedia, particularly Moving Panoramas). I’ve not found illustrations of this or other Hamilton panoramas. They had a number over the years, probably twelve. I’m slowly drawing up an itinerary of them (with inevitable gaps) but it can be slow (if interesting) work following their progress. Later they sometimes had 3 or even 4 on the road concurrently. By the 1880s they travelled mainly in the north, under an agreement with Poole’s who by then were the one other major surviving firm touring such shows. By then all the shows had accompanying singing and vaudeville acts to provide some variety. There was a “guide” (or lecturer, or cicerone) who gave a commentary and was usually also a singer who would sing an appropriate German song as they were showing the Rhine, etc. With the military shows there were the servicemen such as Doughton, and for their Zulu War panorama they had Private Jones, V.C. The later panoramas had increasingly elaborate “effects” – a model train coming out of a tunnel, a ship sailing along the front, and transforming scenes. Once again, I must thank him for starting this particular hare. This entry was posted in Uncategorized and tagged 13th Light Dragoons, Charge of the Light Brigade, Crimean War, Joseph Doughton by Philip Boys. Bookmark the permalink.